Purchase tickets to To Kill a Mockingbird online, at the theatre box office, or by calling 212-239-6200. The Shubert Theatre had its genesis in the New Theatre, an “art” playhouse located on Central Park West that was devoted to serious repertory drama. Although the project was a critical and commercial flop, the New Theatre Group, which included Lee Shubert, leased a plot of land between 44th and 45th Streets to construct a new venue. The plan was abandoned, but Lee Shubert and Winthrop Ames, a former New Theatre partner, acquired a lease for the site, and built two adjoining playhouses there. Lee and J.J. operated the larger of the two auditoriums, which they named the Sam S. Shubert Memorial Theatre to commemorate their brother, who had died in May 1905. Ames managed the smaller Booth Theatre. 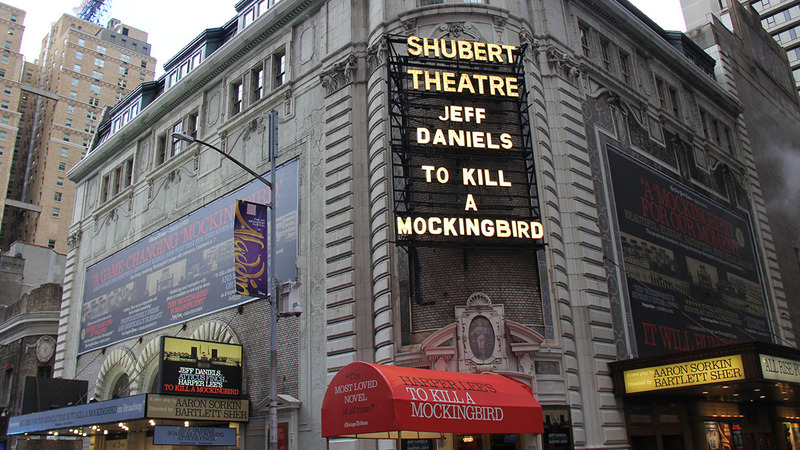 To Kill a Mockingbird is currently playing at the Shubert Theatre. The Shubert Theatre has 1,502 seats and is one of the Shubert Organization‘s 17 Broadway theatres. 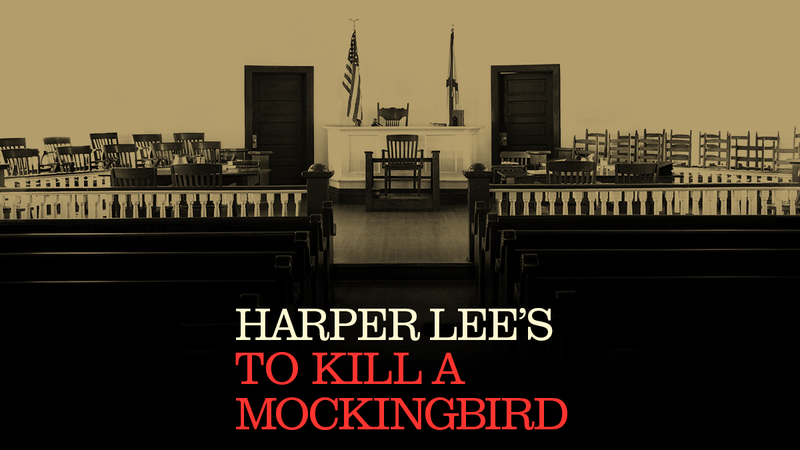 To Kill a Mockingbird is recommended for ages 12 and older. Children under the age of 4 will not be permitted in the theatre. Restrooms are located down one flight of steps (20 steps) or upstairs on the Mezzanine and Balcony levels. There are no wheelchair-accessible restrooms available in this theatre. Wheelchair-accessible restrooms are located at Sardi’s Restaurant (fourth floor, accessible via elevator) directly across the street. Mezzanine location: Located on the second level, up two flights of stairs (34 steps). On the Mezzanine or Balcony level, there are approximately two steps per row. Entrance to the Mezzanine is behind row K.
Balcony location: Located on the third level, up three flights of stairs (56 steps) from the Orchestra. On the Mezzanine or Balcony level, there are approximately two steps per row. Entrance to the Balcony is behind row J. The Shubert Theatre provides at least 10 infrared assisted-listening devices for every performance at the theatre. Beginning four weeks after a show’s official opening-night performance, at least 10 audio description devices are available for every performance at the theatre. In addition, there is unlimited access to downloadable audio description software for personal mobile devices, available beginning four weeks after a show’s official opening-night performance, which provides an automated detailed account of the visual of the production, free of charge, for blind or partially sighted patrons. The theatre also offers handheld devices and software that provide captioning for deaf or hard-of-hearing patrons, available beginning four weeks after a show’s official opening-night performance. Additional devices can be available with at least 24 hours’ notice by contacting Shubert Audience Services at 212-944-3700 or [email protected]. There is also a representative at the Shubert Audience Services kiosk at every performance to assist any patron with the audio description devices, software, or captioning devices. The Sam S. Shubert Theatre, named in honor of the founder of the Shubert theatrical empire, is one of the jewels in the Shubert Organization’s crown and home to some of Broadway’s longest-running musicals. It opened on October 2, 1913, with Hamlet. The Shubert’s most recent tenants have been the Tony Award–winning musicals Hello, Dolly!, Matilda (1,554 performances), and Memphis (1,166 performances); Blithe Spirit; Monty Python’s Spamalot (1,575 performances); Forever Tango; Bernadette Peters in Gypsy; the revival of Chicago (now at the Ambassador Theatre); Big; Crazy for You (1,622 performances); Buddy: The Buddy Holly Story; and A Chorus Line, the multi-award-winning musical that ran for 6,137 performances, from 1975 to 1990. Other 1970s productions included A Little Night Music, winner of six Tony Awards; Over Here!, a musical starring the Andrews Sisters; Edward Albee’s Pulitzer Prize–winning play Seascape, starring Deborah Kerr, Barry Nelson, and Frank Langella (Tony Award); and Ingrid Bergman’s last appearance on Broadway, in a revival of The Constant Wife. Highlights of the 1960s included Barbara Cook in The Gay Life; Barbra Streisand’s Broadway debut in I Can Get It for You Wholesale; Anthony Newley in Stop the World — I Want to Get Off; Here’s Love, Meredith Willson’s musical version of Miracle on 34th Street; Barbara Harris in The Apple Tree; Steve Lawrence, Eydie Gorme, and Marilyn Cooper in Golden Rainbow; Promises, Promises; and Vivien Leigh and John Gielgud in Ivanov. The 1950s brought Lerner and Loewe’s musical Paint Your Wagon, starring the veteran James Barton; Katharine Hepburn and Cyril Ritchard in Shaw’s The Millionairess; Rex Harrison and Lilli Palmer in Peter Ustinov’s The Love of Four Colonels; Cole Porter’s hit Can-Can with showstopper and Tony winner Gwen Verdon; Rodgers and Hammerstein’s Pipe Dream; Judy Holliday and Sydney Chaplin winning Tony Awards for Bells Are Ringing; Gertrude Berg and Cedric Hardwicke in the comedy A Majority of One; and Jackie Gleason in Take Me Along. The 1940s brought two Rodgers and Hart musicals, Higher and Higher and By Jupiter; Katharine Cornell and Raymond Massey in The Doctor’s Dilemma; Mary Boland and Bobby Clark in The Rivals; Paul Robeson, José Ferrer, and Uta Hagen in Othello; Mae West in Catherine Was Great; Celeste Holm in Bloomer Girl; Phil Silvers and Nanette Fabray in High Button Shoes; Rex Harrison (Tony Award) in Anne of the Thousand Days; and the Lunts in I Know My Love. Gems from the 1930s: Fred Astaire in Gay Divorce; Walter Huston in Dodsworth; the Lunts in Idiot’s Delight (Pulitzer Prize); Rodgers and Hart’s Babes in Arms and I Married an Angel; the Lunts in The Seagull and Amphitryon 38; and Katharine Hepburn’s great success in Philip Barry’s The Philadelphia Story.